Locate deep sky objects quickly and easily ! 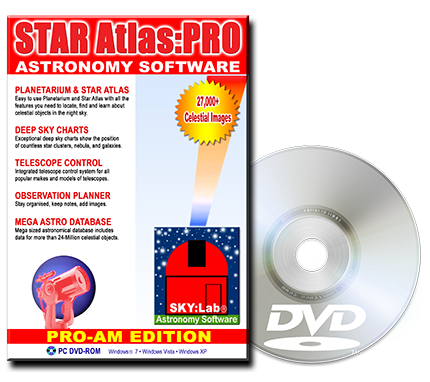 The Argo Navis™ and STAR Atlas:PRO™ teamed together make a powerful combination for amateur astronomers. Simply move your telescope while watching the reticle glide across the chart. In no time at all you'll locate dozens of celestial objects. STAR Atlas:PRO provides comprehensive support for the Argo Navis™ Digital Telescope Computer from partner company Wildcard Innovations. 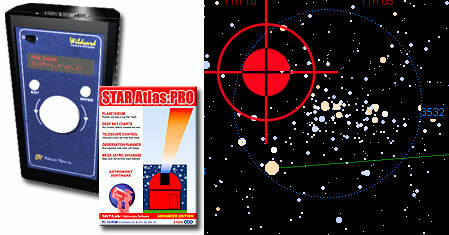 STAR Atlas:PRO includes a native (in-built) driver for the Argo Navis™. As you move your telescope, the reticle glides cross the chart allowing you to any object of your choice with ease and comfort. Display a cross-hair pointer, an Eyepiece field of view, or a CCD frame centered wherever you point your telescope. Add all your favourite objects into STAR Atlas:PRO's Observation Planner and then automatically download them into the Argo Navis user objects catalogue. Monitor Argo Navis™ internal Temperature, Encoder step positions, internal Date and Time.